Below are answers to questions you may have when visiting Kalari Ayurveda Centre for the first time. Yes consultations and treatments are by appointment only. You can call us on 0424 939 130 to make your appointment or for enquiries. Please leave a message if the phone is unattended. Your call will be returned as soon as possible. What time should I arrive for my first visit? Please arrive 10 minutes before your first appointment in order to fill out the necessary paperwork. This will include your contact details, medical history and consent for treatment. All information given to us is kept confidential. If you have scans and medical reports related to your injury, please bring them. Please bring a list of any medications you are taking. This will vary depending on the individual and the condition. We will be able to advise you of a time frame during the initial consultation. Can your treatments be used in conjunction with other treatment? Yes, we can work with your medical doctor or other health practitioner. Ayurveda & Kalari Chikitsa can be used on their own or as a complement to conventional medicine. What should I wear for my treatment? Due to the abundant use of oil in these therapies, it is advisable to wear old clothing. It is recommended to leave the oil on for at least an hour, but we have a shower available if you need to remove the oil for travel, work etc. For serious or chronic pain, a consultation is required before commencing treatment. This is so a thorough assessment can be performed and a program specific to your condition can be designed. What can I expect in a consultation? 1. A thorough assessment of your pain, injury or discomfort. 2. A detailed explanation of the underlying causes of your condition. 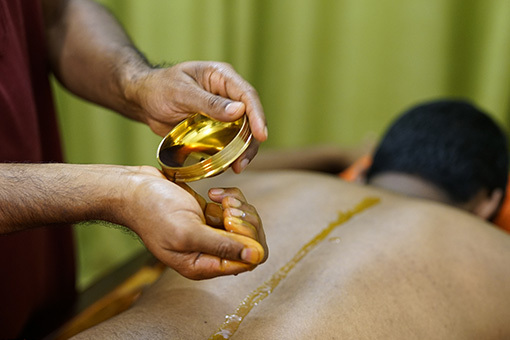 A range of Kalari Chikitsa and Ayurvedic treatments are available to treat and prevent your aches, pains and injuries, and to enhance your overall health. Originating in India, Ayurveda is one of the oldest, most comprehensive health systems in the world. While Ayurveda provides a vast guide of practical advice and wisdom on almost every aspect of your health, Kalari Ayurveda Centre specialise in its use for pain and injury management. 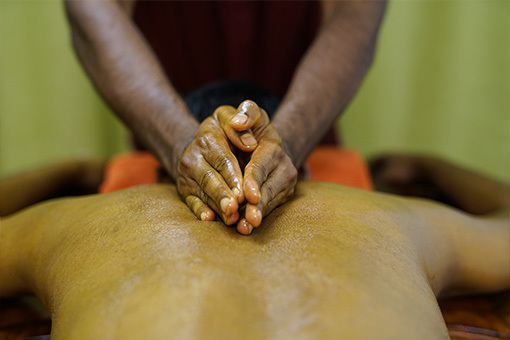 Brisbane’s Kalari Ayurveda Centre uses the traditional Indian healing systems of Ayurveda and Kalari Chikitsa to effectively treat your aches, pains and injuries. Learn Kalaripayattu, the ancient Indian martial art form, at our school in Brisbane.